Krispy Kreme's latest is the new Reese's Outrageous Donut based on the new Reese's Outrageous candy bar. The new donut features a chocolate yeast ring donut dipped in Hershey's chocolate fudge icing and topped with mini Reese's Pieces candies, a Reese's peanut butter drizzle, and a salted caramel drizzle. In comparison, the namesake candy bar features a core of Reese's peanut butter and caramel surrounded by Reese's Pieces candies and a layer of milk chocolate. 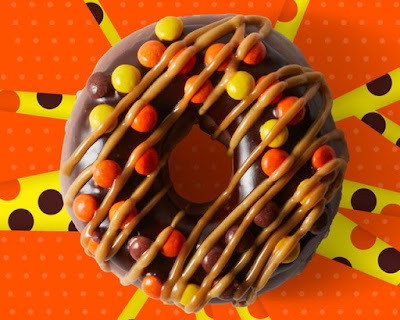 You can find the Reese's Outrageous Donut for a limited time at participating Krispy Kreme shops in the US and Canada.